Little-known Indian startup Smartron was founded in 2014 but only made the news a month ago when it was announced that Sachin Tendulkar was investing in the company and would act as its brand ambassador. Smartron is now promoting itself as a homegrown Internet of Things (IoT) player, which is a very interesting space to be in at this time. We're curious to see what exactly the company will come up with and how it will position IoT products and services in India. 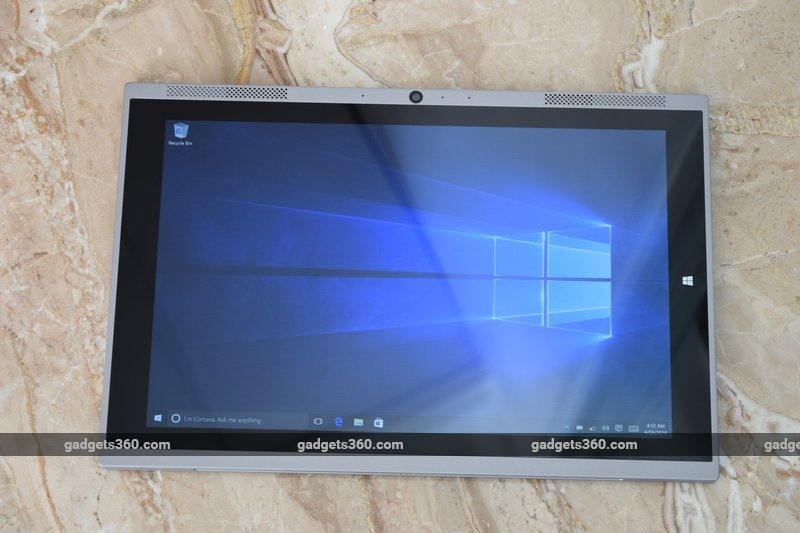 However, it seems we're going to have to wait a little while to see how that plays out, as Smartron's focus right now is on a pair of relatively conventional products: a Windows 10 tablet and an Android smartphone. Today we're reviewing the Smartron t.book, a 2-in-1 tablet with a mid-range price and high-end aspirations. (Disclosure: The Smartron t.book is available via the Gadgets 360 Shop.) 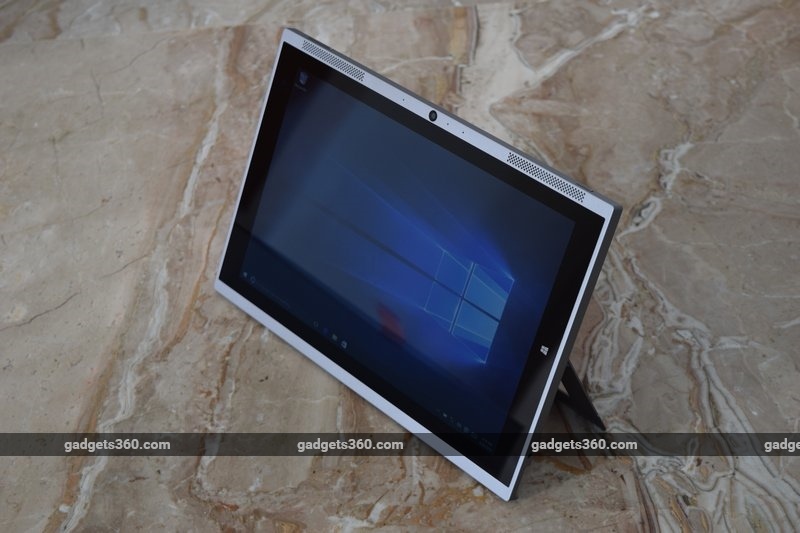 It's immediately reminiscent of Microsoft's iconic Surface line of tablets, though it should be noted that several top-tier companies including Lenovo and HP are trying the same formula as well. 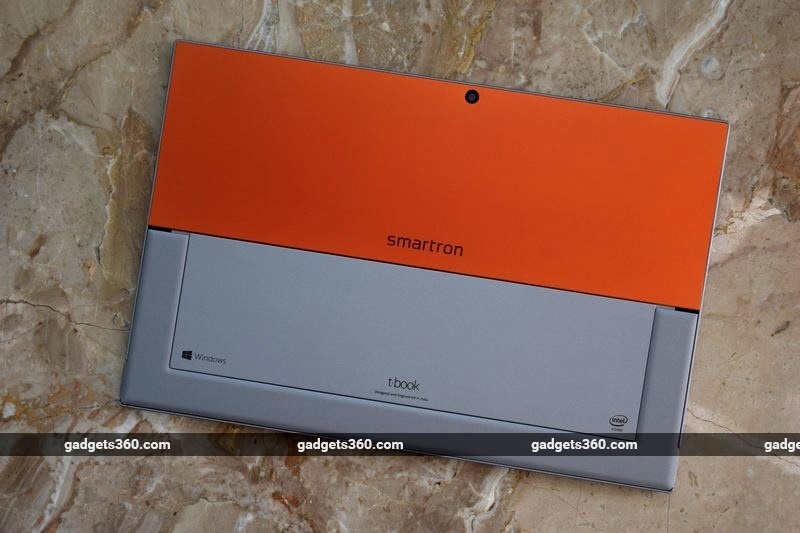 The Smartron t.book is visually striking, but can it match up to PC hardware from established players, and is it better than comparably priced laptops? Read on to find out. First impressions are pretty good - the Smartron t.book's box is slick, and the device is packed very well. Flipping up the lid, you see the tablet itself in a tray, with the charger and keyboard cover hidden in compartments below. The very first thing you'll notice about it is a distinctive orange panel on the rear. It isn't very bright or garish, but it's easily the most polarising element of the t.book's design. You'll certainly be noticed if you whip it out in a classroom or at work, which could be a good thing or a bad thing. Orange is part of the young brand's identity, and while this is the only option available at this time, the company has announced an all-grey version as well. The tablet itself can best be described as chunky. It doesn't have the finesse of a premium product, which is understandable given the price point. The company says the body is built out of magnesium and aluminium. The blocky speaker grilles and prominent webcam above the screen almost give the t.book a retro look. The screen is incredibly glossy and reflective, and picked up smudges within seconds of us peeling off its protective plastic. Below the orange panel on the rear is a narrow U-shaped leg to prop the tablet up. It fits flush with the rear when folded, but pops out easily. It's surprisingly easy to bend and flex, which made us a little doubtful of its strength in the long run. The hinges feel stiff, which is good. You have a very limited range within which the tablet can be inclined - this is better than the folding cloth stands we've seen on budget 2-in-1s which offer no motion at all, but not as good as other tablets which can lie nearly flat for you to draw or play games on. 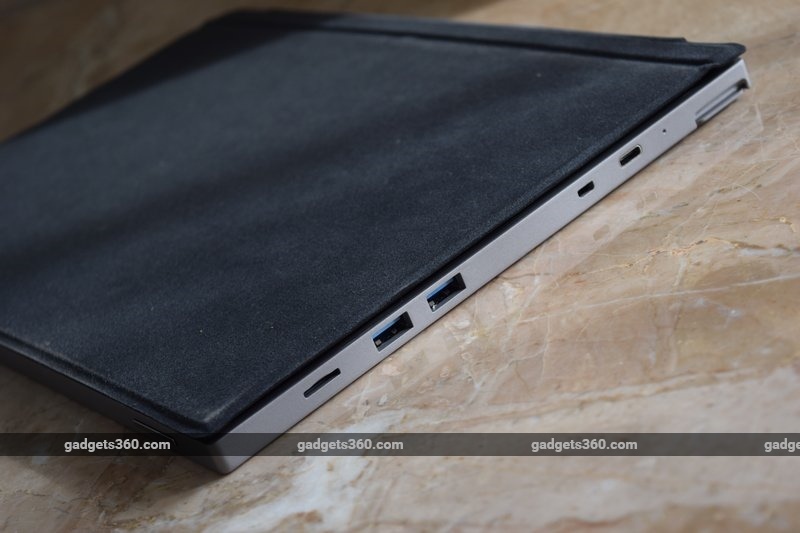 You get a microSD card slot, two full-sized USB 3.0 ports, a Micro-HDMI video output and an additional USB Type-C port on the left of the tablet. The Type-C port doubles as the charger input, which is convenient. The only thing on the right is a 3.5mm audio socket. You'll see big silver power and volume buttons at either end of the top, and contact points on the bottom for the keyboard cover attachment. 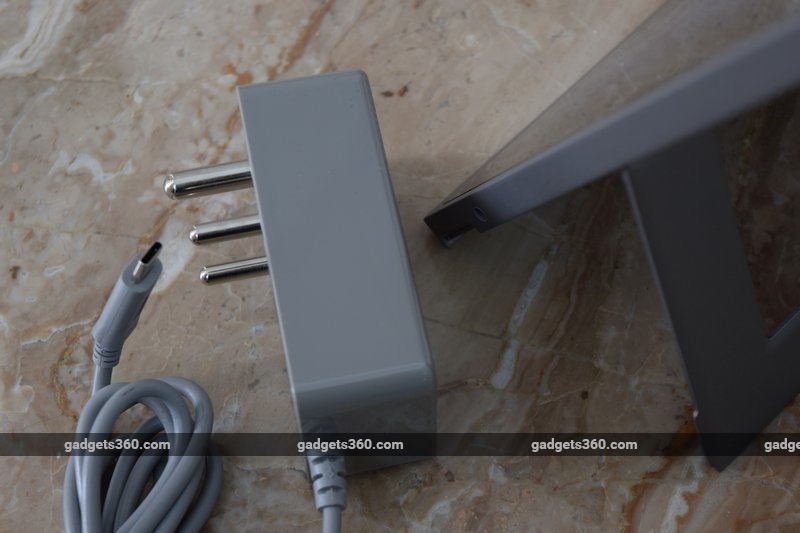 Smartron ships a bulky 36W charger with the t.book, which will be a problem if you need to use power sockets which are recessed or set low on walls - a conventional changer with wires on both ends would have been much better. The USB Type-C cable is also fixed in place. The keyboard case is more of an accessory than an equal half to the tablet. It's completely passive, with no extra hardware such as a battery, more USB ports, or anything of the sort. It snaps onto the bottom of the tablet magnetically and stays firmly in place. 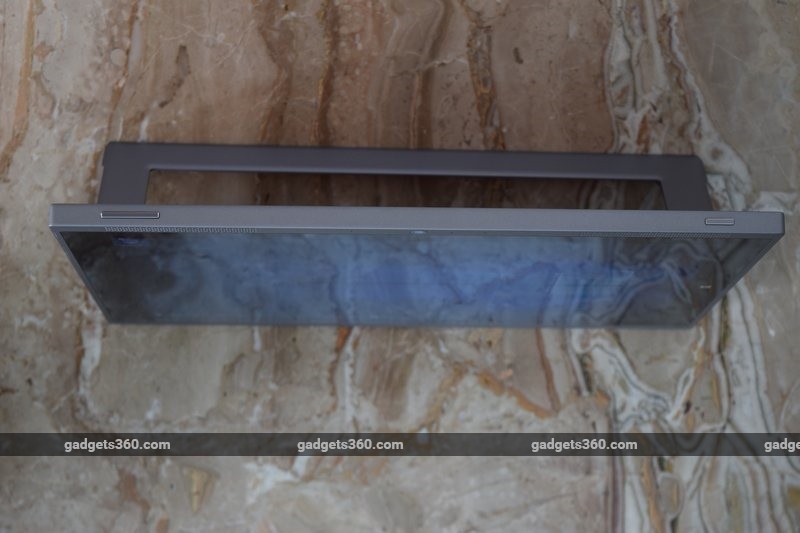 There's an extra magnetic strip that can fold upwards and snap to the front of the tablet, pulling the top of the keyboard so that it sits slightly raised at the rear. 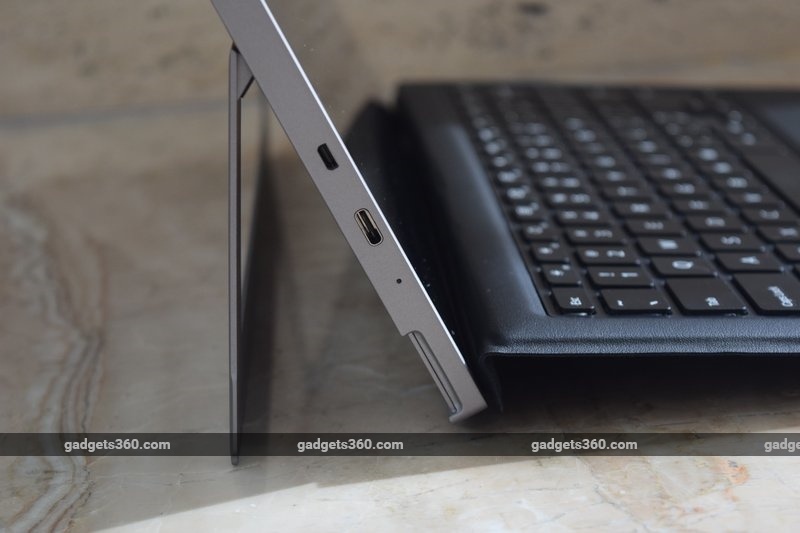 This gives it a slight but comfortable incline, somewhat like the keyboards on recent Microsoft Surface models. The keys are as large those on a laptop, but the trackpad is quite narrow, so we'll have to see how well they work. 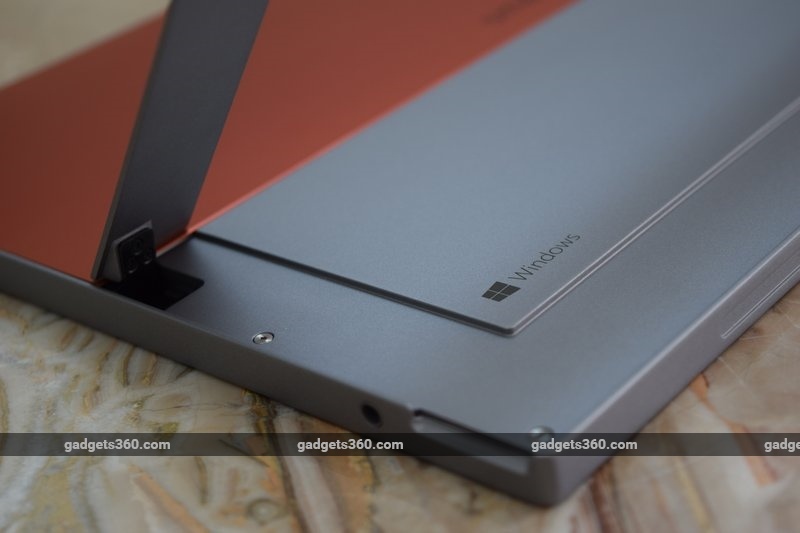 The Smartron t.book slots somewhere above the multitude of inexpensive Atom-based tablets we've seen with small screens and keyboard cases that double up as awkward stands, and absurdly expensive premium 2-in-1s such as the Microsoft Surface Pro 4. Smartron has tried to deliver the functionality of a premium device even with the specs of a low-cost one, which is pretty clever. The t.book comes in only one configuration, at the heart of which is an Intel Core M-5Y10C processor which can run at up to 2GHz in bursts. This a slightly older fifth-generation CPU, and while it's a significant step up compared to the Atom line, it still lets the tablet run cool without a fan. You also get 4GB of RAM, a 128GB SSD, Wi-Fi b/g/n/ac, a 5-megapixel rear-facing camera and a 2-megapixel webcam. The screen measures 12.2 inches diagonally and has a surprisingly high resolution of 2560x1600 pixels. That also means it uses the 16:10 aspect ratio which is not only more comfortable for desktop work, but also makes the tablet easier to use in portrait mode. The microSD card slots allows for up to 128GB of additional storage, which could come in handy. You get a 64-bit copy of Windows 10 Home, and the standard 30-day free trial of Microsoft Office. There's no security suite which is unusual, but not a problem for those who like their computers bloat-free. Smartron pre-loads two apps of its own: Hubtron and t.cloud, which are both part of the company's IoT play. You have to sign up for an account using your email address and phone number in order to use them. The former has sections to let you buy Smartron products and accessories, jump to the company's online forum, chat with a customer care rep, and see your history of purchases and service requests. The chat option tries to automatically launch a remote access session, which could be a little alarming to some users, and some of the other sections seem unfinished at the moment. The t.cloud app is an automatic backup tool which promises that you'll never lose your data, and also lets you browse through messages, photos, and contacts remotely. It seems as though this functionality will play heavily into the company's upcoming smartphone launch. Smartron's website has information about upcoming controls over how and where user data is stored, but there's no word about how much cloud storage you get or what it will cost to use more. The Smartron t.book runs Windows 10 but doesn't automatically switch between tablet and desktop modes when the keyboard is attached or detached. However, the device does automatically go to sleep when the cover is folded over the screen and wake up when it's opened, which is a huge relief. The tablet on its own is a bit unwieldy to hold in one hand and use, but works better if you're sitting or lying down. It doesn't support a native stylus so isn't as versatile as some other tablets - though again, this isn't a criticism considering its price. One immediately noticeable problem is that the screen is way too reflective. It's really difficult to set up a position which lets you see everything clearly, especially in an office with lots of overhead lights. The kickstand proved to be stable enough to support the tablet, but you still need a tabletop to use it effectively - it won't balance well on your lap. There's no doubt that the screen is sharp - Windows is set to 200 percent scaling by default, which leaves you with a usable 1280x800 display area. We preferred the 125 percent setting, though this did make touch controls a little more difficult. Colours and viewing angles are also more than decent. It's nice to have front-firing speakers, but they're unfortunately quite tinny and scratchy, and even the highest volume setting isn't very loud. We felt strong heat from one spot on the back left when running heavy apps and games. The keyboard turned out to be pretty good - the keys are a little wobbly but the action is overall better than we've felt with similar snap-on accessories that come with many low-cost tablets. The keyboard layout is comfortable and none of the keys are too small or cramped. The padded wrist rests are also quite nice. When used in its raised position, the keyboard loses the support of a flat surface and tends to flex a little, so it isn't as comfortable as we'd hoped. However, the trackpad is another story altogether. We found it to be imprecise and oversensitive, sometimes registering touches when our palms were barely in sight of it. It also sometimes turned single-finger taps into Windows 10 gestures, resulting in weird behaviour such as our text cursor jumping around the page in Word, and windows tiling or minimising themselves unpredictably. We brought this issue to Smartron's attention and the company said it was aware of it and will soon issue a software update to improve the trackpad's performance. As far as raw performance goes, we ran through our usual suite of benchmarking tools, and found that performance was up to the mark for most day-to-day activities. Unsurprisingly, we were able to match most scores with the Asus ZenBook UX305FA Ultrabook, which is based on a version of the same processor but is priced one step higher. PCMark delivered 2126 points in the Home test and 2046 points in the Work test, while 3DMark showed that 3D gaming is certainly not this device's strong point with a weak showing of only 406 points overall. Cinebench managed a decent 165 CBU points, and this is a test that doesn't even run on many Atom-based systems. POVray completed its built-in benchmark in 14 minutes, 47 seconds. Read and write speeds were below par for SSDs, though still much better than a spinning hard drive would manage. We also tried the low-impact Tomb Raider (2013) just to see how it would run at various settings. Even the menus were sluggish till we dropped the screen resolution down to 800x600, but everything then became awfully jagged and blurry. After a few trial runs, we settled on that resolution with Normal settings - nearly all effects turned down to their minimum - but we did get a playable average of 29.9fps with a reasonable minimum of 22.6fps. The back of the t.book got so hot during this test that we weren't able to hold it in our hands, but if you ever do feel like gaming, you'll have it on its stand anyway. The battery lasted a surprisingly long time - 3 hours, 40 minutes in Battery Eater Pro. We managed to make it through an 8-hour workday with mostly Web browsers and light document editing work. Smartron is a brand new company, but it seems to have heavy backing and ambitious plans. The t.book is a clever product and there's certainly a niche for it. A lot of people will be drawn to it for its looks and novelty value, but the main question is whether it will serve their needs as a computer. 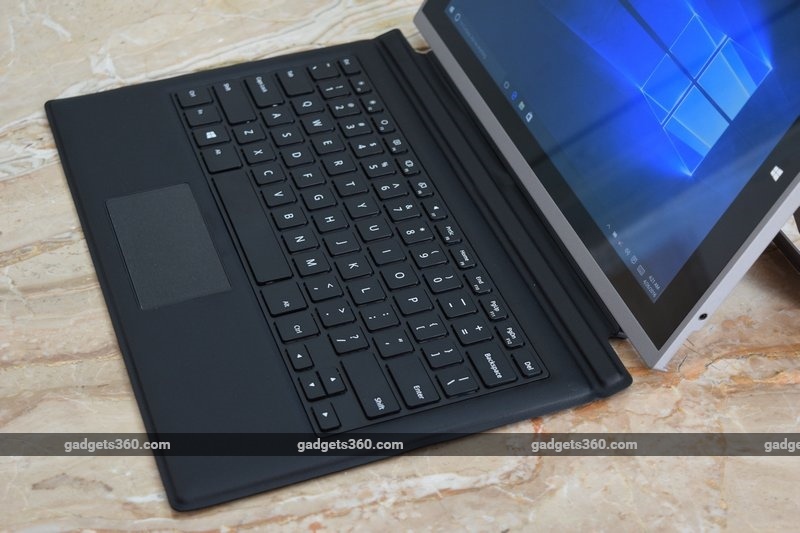 It certainly is flexible, and Windows 10 has a lot of little touches that make both tablet and desktop use possible. The size of the t.book also makes it much easier to use than budget 10-inch tablets with cramped keyboards. That said, the Smartron t.book's looks aren't for everybody and we were frustrated by the finicky touchpad on the keyboard attachment, though Smartron claims a fix is on the way. Having said that, you cannot look at this product expecting all the functionality and finesse of a Microsoft Surface Pro on the cheap. The Smartron t.book is a different kind of device and there's nothing like it in the market at this price point right now. However, if you need a machine primarily for productivity, you're better off spending your money on a regular laptop.Nonetheless, we're intrigued about the IoT and cloud features that will someday take the t.book from a standalone product to part of an ecosystem. 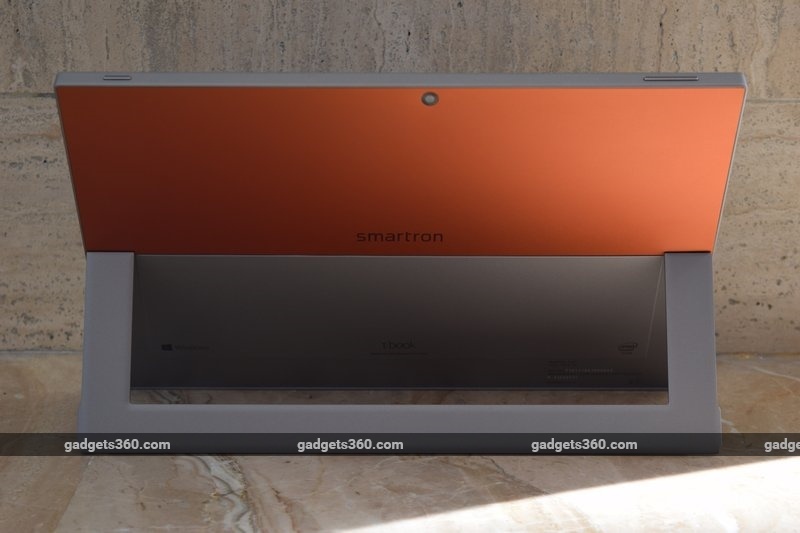 Disclosure: Gadgets 360 is the exclusive retail partner for the Smartron t.book.